I have happy feet, they like to walk, so I often let them wander. But when I walk around Auckland, dangerous situations are encountered with almost every step. I tell you now: It’s perilous out there. If Auckland wishes to become the “world’s most livable city“, then I’m quite serious when I say that we are going to need to blow things up. Street by street, intersection by intersection, we are going to need to get out the dynamite and let ‘er rip. We need to do this because Auckland’s current pedestrian environment is the antithesis of “livable”: It is life-endangering. We’ve got five decades of auto-dominated designs to undo, and I don’t wanna wait that long for my home city to become somewhere that I can tolerate living for more than a few years at a time. 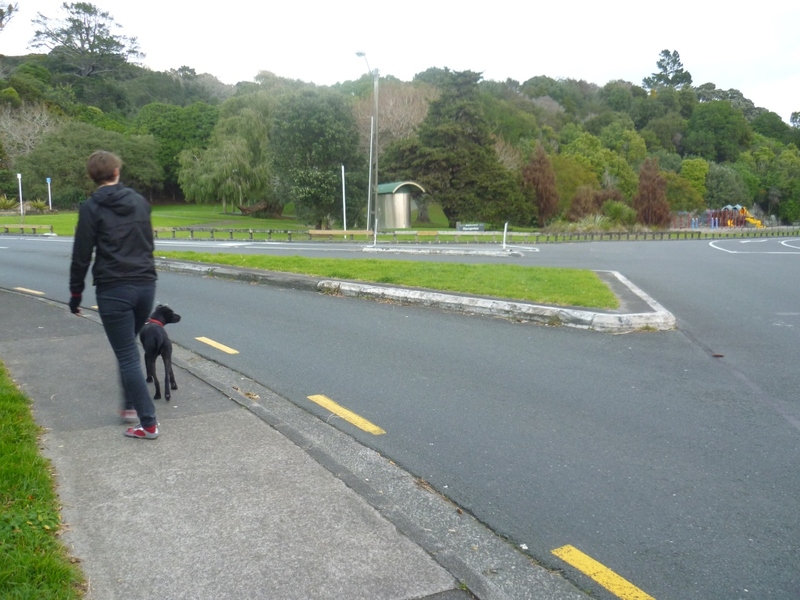 Over my next few posts I’m going to use a short (1.5km) walk to demonstrate some of the many ways in which Auckland fails its pedestrians, and by extension all of its people. The walk takes us from our flat, in Grafton, to the verdant green slopes of Maungawhau (aka Mt Eden). This is, incidentally, a walk that I make quite regularly with my flatmates and our puppy (Princess Kuku has four very happy feet and would walk all day if she could). In fact I’m sure that many people make this walk, because Maungawhau is a simply stunning natural feature. Our normal walking route (the most direct) is shown below. For today let’s focus on the intersection of Normanby Road and Clive Road, because it’s a real doozy. The issues with this intersection should start to become apparent from the aerial below. If you can’t see what’s wrong, then just imagine you are a pedestrian walking south along the eastern (right hand) side of Normanby Rd. Now imagine that you want to cross Clive Rd, which intersects with Normanby from the bottom right of the photo. At which point you can will confront 32m of vehicle dominated junkspace in which the only pedestrian facilities are a couple of pram ramps located approximately 30m to the right of the natural pedestrian desire line. That’s a big detour. Now if Clive Rd was somehow a major arterial leading onto a cloverleaf highway interchange in Florida that was frequently used to transport space ships, then you might be able to justify the geometry shown above, and perhaps even the deviation asked of pedestrians. But it’s not: Clive Rd is a piddly little nothing road that disappears into sleepy residential suburbs. By my calculations, the left turn slip lane from Normanby Rd into Clive Rd has a geometric design that could comfortably accommodate Tiger tanks travelling at Mach 3 speeds. But of course, pedestrians are not Tiger tanks and they don’t travel at Mach 3 speeds. If they were given a choice, pedestrians would amble, meander, and stroll while chatting about what they want to do with their lives – but in this environment you can’t do anything but scamper out of fear for your life. This is what crossing Clive Rd looks like from Princess Kuku’s perspective: Pretty freakin’ freaky. Aside from the heinous geometry, if you are one of the few pedestrians fortunate enough to make it across the other side of the intersection, then you will find there is no footpath. Nor even a bit of muddy ground where you can rest your feet. I know what some of you are thinking: It is a bit rich to expect a footpath. After all, the traffic engineers have had to work really hard to squeeze four vehicle lanes and a traffic island into that 32m. There’s not much room left once you accommodate Tiger tanks travelling at super-sonic speeds, as I’m sure you can appreciate. A lack of a footpath is actually the least of my concerns, however. Because instead of a footpath, pedestrians actually encounter what is possibly the world’s most spiteful little wooden fence. A fence whose sole purpose in life seems to be to slow pedestrians down long enough to be hit by a car. Or at least trip them up and bruise their shins. As shown below. You can see where the wooden railings have had to be replaced because people have walked into them so many times. Of course I do understand why there’s a fence: We do need to stop little critters from wandering out of the park and onto the road. But by placing the fence hard up against the kerb we have created a real hazard for any pedestrians crossing the road. What’s more, the intersection is so wide you can’t readily see that there is not a footpath on the other side before you start crossing. It’s all so, so wrong. I want to finish on a positive note. Despite it’s failings, as a perfectly rationale econo-bot I do acknowledge that the pay-off I receive at the end of this walk is sufficiently large to outweigh the menacing pedestrian environment encountered along the way. 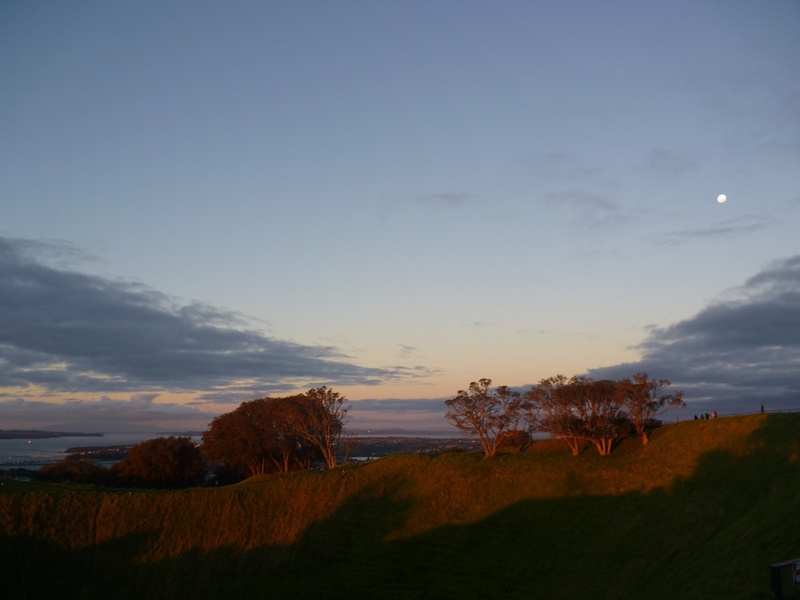 And that pay-off is views like the one shown below, which is a simultaneous sunset/moonrise over Maungawhau’s spectacular crater in NZ’s gloriously sharp winter’s light. Thats a good idea Stu ………. privacy issues etc doing that. (which reminds me I still do !) …. Hope you survive I will be interested to see how it all goes ! Fully support just taking a camera with you and getting photos of any poor designs you encounter – send them through to me and I’ll try and whip them into a “guest” post.. Thanks Stu – a lot of it is just maintenance of walking areas that become hazards …..
probably bump across some design issues as well….I have just forgotten them at this point probably. I had little choice to stage it to get a break in the traffic ….it was not something I was that happy to be doing …..
That little fence is not for critters, it’s too keep people from parking on the grass. Why not bollards then? That would still let people walk through, but keep the cars out. 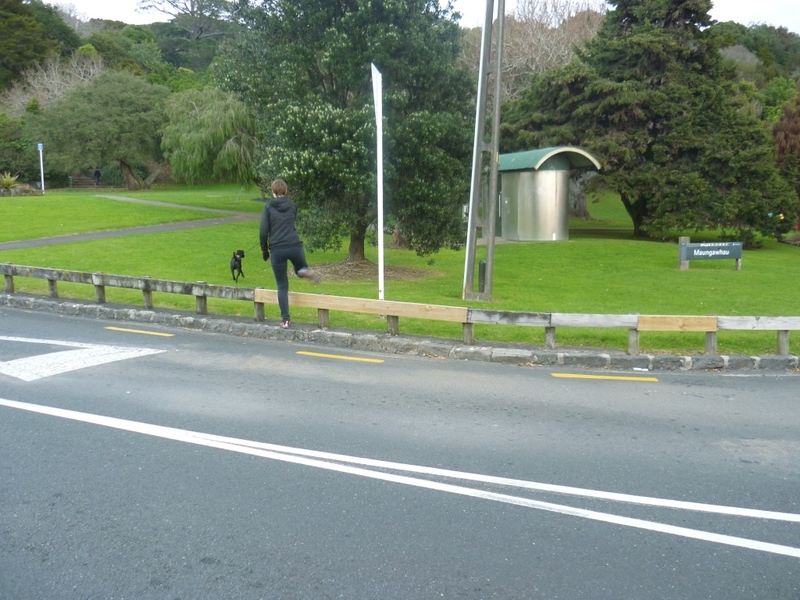 Increasingly parks (eg Gribblehurst) use the timber bollards instead of these low fences. Either way, pretty sad to have to armour parks from cars. You can see the issue in the photo. No kerbs. Basically the lack of kerbs and the parking in front of the NZ Post building means cars treat that areas as road. Cars perform U turns there. People park there. They use it as a pickup/drop off point for the Telecom campus. Taxi drivers use it as a taxi stand (I quietly photographed the last one and he then followed me in his taxi yelling at me from the window demanding to know why I took his picture!). The NZ Post courier drivers don’t even slow down when driving into the depot (one actually clipped me the other week). I complained to NZ Post since it’s their parking. They said they don’t control what happens on the roads or in front of the building. A complaint to AT resulted in them ringing me back saying they couldn’t do anything about it since there was some resource consent process happening but they’d have the traffic wardens keep an eye on things. That was some months ago. I see now there is building work happening there. After nearly being run down the other week I contacted AT again. I asked if there was some way to find out what provision was being made for pedestrians there with all these changes happening. They acknowledged the question and I am waiting for the response back. I now totally avoid the area. It’s just too dangerous. They’ve made a hash of the new bus stop there too with all the scaffolding on the footpath. Oh, another totally non pedestrian friendly area is St Lukes mall. I don’t think you can even get into that place without going through a car park. The entrance on Morningside Drive closest to the bus stop doesn’t even have a footpath. I actually work in the NZ Post bldng. And yes, Hardinge is a gauntlet. The block development (two new office towers going in!) doesn’t seem to provide for changes to the street, from what I can see anyway. However I’ve seen some docs in the past (I think it was in the Auckland 20yr plan?) which suggest hardinge may become a shared space. What; do you mean that someone at AT – or more probably the ACC – contemplated denying Auckland motorists their god-given right to park anywhere, thus infringing their legally-protected right to drive everywhere? I’m shocked and would like to think that AT no longer condones this attack on motorists’ rights. Totally agree with your post Stu. I also live in Grafton and push my daughter in her buggy to that park often. The pram ramps are located so they’re (1) an annoying detour, (2) far enough up Clive Rd that you can’t see traffic heading south on Normanby Rd that may be turning into Clive Rd, (3) close enough to Normanby Rd that you have to cross at pace so as to avoid the traffic that you can’t see turning out of Normanby Rd. Also cars come nice and fast down the hill on Clive Rd adding to the danger and there’s no refuge island in the middle either. Looks like you’re crossing at the wrong spot as there is a gate/bollard entrance about 10m to your left. “wrong spot” – you would be correct if one presumes that 1) taking pedestrians 10m out of their way (it’s actually more like 20-30m) is appropriate. I don’t think it is and 2) everyone’s heading to the park. I don’t think they are. “TBH there are better ways to walk”. Errrmmmm – yes there are, but that’s not really the point is it? Should not a city that aspires to be livable look to provide basic pedestrian facilities in most places? Especially in areas that are so central, such as this? And the “worst spot” you mention is the subject of the next post ;). The real problem with the “wrong spot” is it takes you just far enough around the corner, that you can’t see approaching cars before they are on top of you. This makes it a really dangerous place to cross. All it takes is one motorist driving a but quick (something very easy to do given the grading on the corner) and the outcome for the pedestrian would be inevitable. 1. Along the north side along George Street past ACG Parnell College. Cross Titoki Street and – oops! No footpath. Have to cross to south side. 2. Enter the Domain at the corner of George and Carlton Gore. No footpath through the entrance – you have to walk on the actual vehicle entry. 3. Inside the Domain now, and walking along Grandstand Road South. Constantly looking back over shoulder as every morning cars come roaring up behind. Currently the street lighting and the lights in the grandstand are not working (this is 6.30 am so it’s still dark), so feeling doubly vulnerable in dark clothing. Dear God why do we even have cars in the Domain? 4. Make it to the hospital where inevitably a couple of cars will run the red light turning right into the hospital entrance. Still – a convenient place to be run over, I suppose. 5.Arrive at the Grafton Road intersection. Now this one is seriously scary. Get green man. Start walking. Green man turns red. Cars turning left off Grafton Bridge to go downhill into Grafton Road think that because they now have a green light they should not have to wait for peds, who they assume have crossed against the red man. The few cars which do wait for the peds have buses and other cars behind them putting the pressure on to get around the corner so they can proceed across towards the hospital. (It is still before 7.00 am so cars are still allowed on the bridge). 6. Walk over Grafton Bridge. Also very scary. Have you seen how narrow that footpath is, and how close you are to the buses? Nobody obeys the 30 km/h speed limit, with the honourable exception of the Link buses. (The Waka Pacific buses exceed 50 and then charge through the red light at Symonds Street). 7. Arrive at Symonds St. Hallelujah – A barnes dance! Safe to cross … but no, here comes Waka Pacific barrelling through. 8. Down Queen Street, where the downhill traffic thinks it is still on the motorway. 9.Cross the lovely Mayoral Drive intersection, where after waiting for half a day for a pedestrian phase I am killed by another red light runner in the high-speed turning lane. Lovely walk, that. are some improvements happening in the Domain right now. The temporary road closures have made my walk to uni sooo much nicer, no traffic jams to fight. Are some more ped crossings going in, and even cycle lanes. However also seem to be making things worse for peds at the Domain/Lower Domain intersection. Also still areas with missing footpaths such as ‘The Crescent’ potentially being made worse by allowing through traffic. Yes Boston Rd is grim and not really an alternative for us. Mountain View is OK – we walk home that way just for some variety. I work just around the corner from this intersection and agree with everything that you say. I frequently go to the park and struggle to cross this road safely. The roads are wide enough that cars feel like they can travel at speed and the visibility for cars and pedestrians alike is pretty bad. It is definitely in need of some thought (roundabout maybe?). The worst thing about this intersection is that it does not work for anybody – it is a nightmare for cars as well. I see many a near miss at this intersection with cars pulling out of Edwin St having to ‘gun it’ to get onto Normandy Road plus all sorts of confusion caused by the slip lanes turning into Clive Road (who even has right of way if one car is turning left from Normandy and one car is turning right, both onto Clive Road ?). I think traffic engineers should have to sit for a day and watch the interaction between cars and pedestrians at intersections they design. I am sure if they observe what happens in practice they might design intersections differently in the future. If you want another awesome intersection that is just around the corner – check out the corner of View Road and Esplanade Road. Even the google maps satellite image (if you are seeing the 3D satellite image) appears to show a crash about to happen. For drivers this intersection is ambiguous and confusing causing some drivers to completely ignore the right of ways and others to just stop like a deer in headlights until there are no other cars before proceeding. The worst part for a pedestrian though is that the roads are so wide to cross and drivers are so unsure of who has right of way that you can never feel safe crossing (I have almost been hit on my bike here multiple times too). Thanks GMoney, that View/Esplanade intersection has always struck me as illegible and (by extension) unsafe. As someone who walks though the View/Esplanade intersection every day, I concur that it an accident waiting to happen. The crossing is staggered 30 m into the quiet street to discourage prams and kids from crossing right on the problem corner. At times it used to get very busy (School buses IIRC), not sure now though? Buses can easily turn sharper corners – they just need to slow down more. And just because it needs to accommodate large vehicles does not mean pedestrians should be treated as poorly as they are. poor inputs = poor outputs. Urm, if it’s designed for buses to take it at speed, then last thing i am going to do is cross 30m down from the corner so that i can’t see the bus coming from the north that is about to hurtle around the corner and kill me. If they weere thinking about pedestrians then it would have been a zebra crossing on a large speed table. They were thinking about motor vehicles just like every other intersection in Auckland. From the Esplanade end, If they removed that lone car park on Esplanade it would enable a much better turn for buses, they could make the raised median wider, move it to the intersection, and allow a better intersection for pedestrians. From the View Rd end they could reduce the intersection to a single lane, with it being used for both the left turn and the straight through, which would still allow buses to easily turn, and would again allow for a narrower crossing for pedestrians. On a plus note Maungawhau itself is much more pedestrian friendly since they upgraded the footpaths and stopped buses travelling to the top. yes! Good point. Starting from the top and working down perhaps? yes, I’m sure there’s many more pedestrians inconvenienced by these designs that is commonly assumed – if ultimately because they feel compelled to avoid an area because it’s unpleasant to walk through. And what a fantastic idea re: walkability app for AT! I work downtown, on Shortland Street, and experience similar issues at a number of different spots around the area. It appears that the whole area was designed to allow the partners of the law firms / accountancy firms / merchant banks to get their Porsche Cayennes in and out as fast as possible (ignoring the fact that the vast majority of people who work in the area are not provided with carparks and arrive in the city by public transport or by walking or cycling). This area must be one of the busiest pedestrian areas in the city on your average work day with the number of poeple coming and going from the office towers and shopping districts in the area. First, I have posted once before on this blog about the sad state of affiars at the top of O’connel St where it meets Kitchener Street. Anyone coming down through Albert Park towards the Chancery has to literally risk their lives stepping out onto Kitchener Street where the footpath dissapears in favour of a stone wall. Cars use this street to access the Victoria Street and Chancery Carparks and traffic volumes are reasonbly high on a very narrow road. Then there are the issues of the narrow footpaths on High Street and O’Connell Streets, which are both extremely popular pedestrian areas (although I understand O’Connell street is due for a makeover as a shred space). Next, I often have occassion to walk from Shortland Street to the High Court, using either Princes Street – Waterloo Quadrant, or Eden Crescent. Neither of these options is good for pedestirans. First, using Princes Street, as you reach the top of Shortland Street, you need to cross Princes street in order to head down Waterloo Quadrant. The one option is to walk to the top of Princes Street (outside the Northern Club) and cross on the Green Man (when he finally appears between multiple phases of traffic). However, most people are prepared to take the risk and cross Princes St. This is particularly dangerous toward the Shortland Street end of the street, where cars coming up Eden Terrace cannot see you until they are right on top of you. If you do get across Princes Street, you have to negotiate the random pillar that the Pullman Hotel has kindly plonked in the middle of the footpath (see post here http://greaterakl.wpengine.com/2013/04/08/the-pullman-hotel-scant-regard-for-the-public-realm/), which is difficult if you are lugging a suitcase full of files. Then you get to Waterloo Quadrant. The number of driveways crossing the stretch of footpath between Princes Stret and Parliament Street on the northern side of Waterloo Quadrant is a joke. I have almost been hit by cars a number of time along here. So all up not a good walk for pedestrians on what is a very very popular walking route. The other option is to walk along Eden Terrace, but again this poses serious risks. First there is the issue of crossing Princes Street at the top of Shortland Street. This time there is no way to avoid this (unless you divert to the top of Princes Street) and you just have to take the risk being hit by a car coming up Eden Terrace and turning into Princes Street. There is not even so much as a zebra crossing to help you out. If you did want to avoid this risk, you could try and walk along the northern side of Eden Terrace. However, you then run into the issue of crossing Shortland Street near the intersection with Emily Place. Again, cars coming over the hill from Eden Terrace will not see you until it is too late. 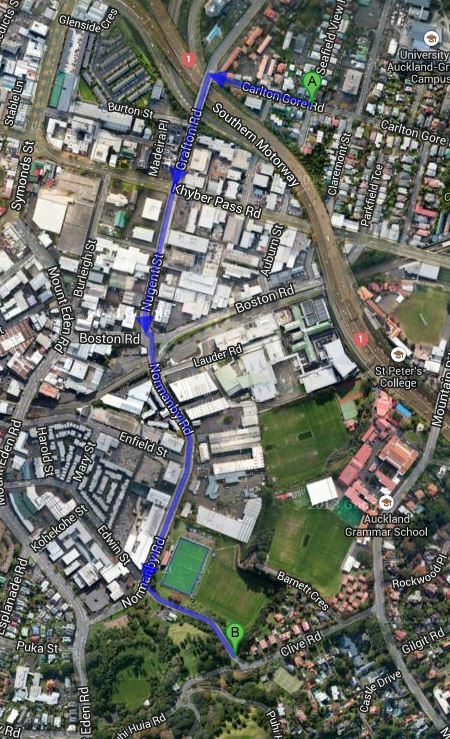 So, either way, walk from Shortland street to Eden Terrace involves crossing a street without a pedestrian crossing, with the risk of cars cresting a steep hill not having time to see you. Finally, there is Shortland Street itself. 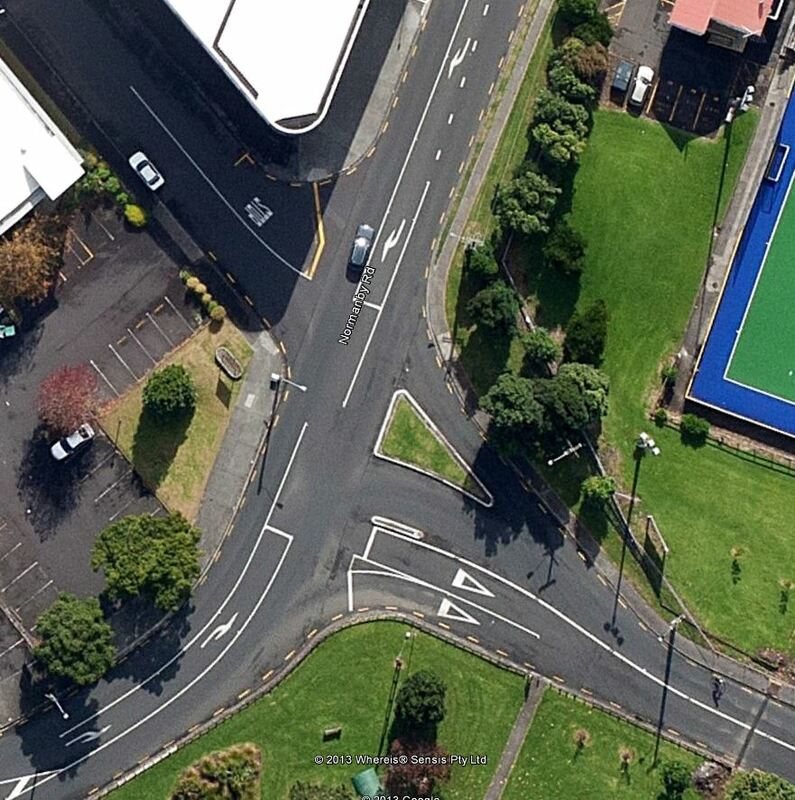 There is not one pedestrian crossing over Shortland Street above its intersetction with Queen Street, not one. This is despite heavy foot traffic coming out of High Street and O’Connel Street wanting to get to Fort Street and Britomart, and the number of people crossing back and forth between the office buildings. There are also serious problems at the intersections of Bankside Street and Fields Lane (both of which cars use to get into the Chancery Carpark and the carparks for the WHK and Forsyth Barr towers). Again there are no pedestrian crossing here. All up, this is a nightmare, and I agree that something drastic needs to be done to make this area even slightly attractive to pedestrians. This is also just a snapshot of a greater issue with downtown Auckland generally (don’t even get me started on Albert Street!). And it’s just as bad on the other side, too. Try to cross Short Street at the Eden Crescent end. The mouth is so ludicrously wide, that in the long, long time it takes to walk across, a car can appear over the crest of the road near Princes Street, maybe indicate for a bit, and swoop around the corner at 60 km/h, squishing you in the process. (They’re the lawyers in Porches you mentioned, so obviously they’re not going to stop for a mere pedestrian). While you are discussing pedestrian unfriendly areas, Stu. Can I bring up one I have recently encountered. Having moved into the city, an area I thought would be nice for a walk is Fanshawe Street, between Nelson Street and Victoria Park, with Clear Point and the other telco headquarters on the other side of the road. My how this section of roading has changed since when I was a student. Was it really necessary to turn this into an eight lane highway? It’s an area virtually in the middle of town. There are people walking, going for runs, but that can’t be good for lungs. This could be a vibrant, people area. Instead it’s a car zone. I work on Fanshawe Street and it is awful.The pedestrian crossing in the middle takes forever if you use the buttons. And it’s a split crossing so you have to use them twice. Usually what happens is you press, wait ages, a gap in the traffic appears and so you cross leaving cars wondering why they then get stopped when there is no one crossing. Doing that this morning may have saved me. I pressed the button and waited then there was a gap so I crossed to the middle. Seconds later, as I waited in the middle of the road on the island, a car heading into the city decided to drive on the wrong side of the road around the pedestrian island to get into the entrance of the BP station there.They did this at speed and went right through the crossing during the green man I had been waiting for. Of course I am sure their excuse would have been they didn’t see the red light because they were on the wrong side of the road and so not facing it! Was it because of the telco buildings that they decided to make that section of Fanshawe Street so wide? Because looking at Streetview, no other section of roading around there is as wide. It doesn’t flow to/from a motorway. The result seems to have been to create an environment unfit for humans. Can’t be that great for people looking out the windows on that side of the buildings. Nothing but roads and cars. Because lawyers know very well that pedestrians can be killed at will in Auckland with no risks. Apart from a munted bumper. But the pedestrian will pay for that as in a story on the Herald few weeks ago. Cyclists are also pretty fair game, as we saw recently (http://www.nzherald.co.nz/nz/news/article.cfm?c_id=1&objectid=10899557). We need stricter liability laws. Hit a pedestrian or cyclist, you have to PROVE your innocence. Not the opposite. The general situation you describe is not helped by those red flashing “CAR COMING” lights, which scream that the car has right of way when in fact they should not. What is the legal status of those? It is, as far as I know, still legal to put a “car coming” sign on the outside of a building you own, and illegal for a private citizen to, say, smash one with a cricket bat. They certainly don’t have any effect on the give way rule, though – cars must give way to pedestrians when crossing a footpath to enter or exit any driveway. I wish they emphasised that during driving license training – so many drivers in NZ simply don’t get that they have to give way to pedestrians on footpaths. Another pedestrian-pestering intersection that includes a slip lane… At least what you see is what you get with this one: the most annoying slip-lanes are the ones where you can only guess whether cars are going to zoom past the slip lane or heading into it, like this one here: http://goo.gl/maps/K7lP7 If you want to cross safely you can wait until traffic has stopped and be rewarded with missing the beg button window. It pays off to plan ahead when walking anywhere for the first time (where would we be without Streetview? ), or you might end up looking for non-existent paths, stumbling upon obstacle courses or having to tightrope your way along a tiny strip of footpath (Clive Road!). It shouldn’t have to be this way. Excellent post. It is interesting that Brian Gaynor in his piece over the weekend mentioned that the city had to get its act together regarding walking. Auckland is absolutely shocking in this regard. I do get annoyed at pedestrians who stop at driveways to allow a car to drive in: I walk straight through. That’s funny harrymc. Some pedestrians choose to stop as a courtesy to the driver; I usually do. Maybe you’re referring to drivers who barrel out of a concealed driveway which is a different matter, although in that situation continuing to walk through does seem a bit risky. I do have one area of concern though: pedestrians who cross the road diagonally while you’re backing out at 2-3km/h. Often they manage to stay in a blind spot until suddenly the parking radar goes off; scary for the driver. You shouldn’t have a blind spot if you’re looking in the direction you’re going – i.e. over your shoulder. You’re allowed to take off your seatbelt if you need to, to turn around. If you’re backing up in a truck where you’ve only got wing mirrors, it’s generally best to have a colleague wave you back. Thank you for your kind advice Steve. Perhaps I need to make myself clearer: if a pedestrian is walking diagonally towards your rear pillar at about the same speed as you are reversing there can be a period of several seconds where that person is invisible to the driver no matter where he looks. That’s why parking radar and reversing cameras are such important safety features, especially since the advent of iPods and texting. We were killing pedestrians before ipods came along. Where is the call to remove audio systems, not to mention modern integrated systems, from vehicles? It’s ok for a driver to have the stereo up and not aware of sounds but not a pedestrian? Did you hear about the driver playing guitar while driving? Yeah, those drivers huh, switched on and alert. “Parents who drive with young children in the back seat spend an average 18 per cent of driving time with their eyes off the road, Australian researchers have found. (being those who are travelling in the same way as “we” are). What we have now on our roads is a mixture reflection of the ideas that were popular at each stage our roading and transport system was developed (or that part of the city was tacked on depending on how you believe we grew). Would I like more pedestrian-centric well personally yes but I don’t think drivers are bad either ……..
and what they see – theres a few driveways to take-away shops etc and carparks where drivers don’t see us or decide to park in the driveway so that you have to walk out onto the road to get around – that’s so stressful for Mum (and I find it hard with the little ones too I must add). But I think its not so much arrogance its just perhaps those people have not walked along that patch- they don’t realise what its like when you do. Hence another reason why I thought Pram and guide dog cam could be educational 🙂 …. Radar is definitely a great thing, but reversing cameras aren’t a particular help in a situation like this since you should be looking backwards rather than at a TV screen. They’re good for checking that there’s nothing on the ground behind your car before you move off, though. In any case, when we’re driving, we’re the ones who are in charge of a tonne and a half of lethal metal, and it’s our responsibility not to hit anyone, whether they’re a Parkour champion in a state of cat-like alertness wearing a hi-viz jacket walking calmly along the footpath in a safe and prudent fashion – or a blind ninja listening to an iPod crawling diagonally across the road at night. Modern vehicle design doesn’t help. As they’ve made cars ‘safer’ for the drivers they get worse for people around them. Some cars have A pillars so massive now you can’t see around them when turning right. And the high window lines are making the windows smaller so visibility from inside the car is reduced. Especially to the rear (which they fix by adding cameras). As an example compare the old Mitsubish Mirage with the new one: http://en.wikipedia.org/wiki/Mitsubishi_Mirage to see how the windows have become smaller and that car isn’t even one of the worst. Pedestrians stop at driveways because they value their life and their body parts and wish to be separated from neither. Apart from a few gentlemen like jonno, of course, all New Zealanders still alive today have all leant that car drivers will automatically assume right of way everywhere. Why, our cities are designed precisely at detail to convey that impression, whatever the law may say. I agree there are a lot of aggressive drivers in NZ, especially Auckland – I actually find London drivers more predictable despite the traffic volumes, or perhaps because of them – but there are foolish pedestrians and aggressive cyclists too. Probably only a small percentage in each category in reality, but enough to cause problems for the rest of us. Back on topic, I certainly wouldn’t cross Clive Rd where Stu attempted to but would use the point opposite the pathway where there’s greater visibility. But then Stu will be much faster on his feet than me. That’s actually quite a busy spot, being one of the links between Mt Eden and Epsom/Newmarket. I carry on when I am out running. Shocks a few drivers. I have to say I quite assertive and in control (looking closely at the driver and car) so don’t feel unsafe. I feel it’s my way of trying to restore some balance. Having said that a ute did come close to giving me a nudge the other week, I had to use some quick foot work to avoid it. That’s fair enough Swan, I used to run and agree that it’s better to maintain momentum. When driving, if I see a pedestrian (running or walking) approaching an intersection that I intend to turn into I (a) indicate, and (b) try to accommodate them by adjusting my speed. It’s not difficult; the main issue is determining whether they are aware of their surroundings. Back to my earlier comment about pedestrians crossing the road diagonally behind me when I’m backing out of my driveway, I’m pretty sure that crossing diagonally or walking down the carriageway is technically illegal, but I would still prefer not to make contact. As for children, my rule is to either keep them in sight or ensure that another adult, who I can see, has them in sight. Obvious really. That whole area is lethal for pedestrians at the moment. Item about the run-over cyclist and the 1.5m rule on Campbell Live tonight. All the viewer feedback they read out admonished cyclists for a wide array of perceived transgressions. It was a symphony of selfish, narrow-minded, uncaring, impatient intolerance. This is what you’re up against. Yes, that Campbell Live story was heart-breaking. Firstly because of the grief of the victim’s family and their simple plea for a change in attitude by motorists, and secondly because despite that plea, the viewer feedback was symptomatic of why a change of attitude is essential. I was gobsmacked. A family opening their lives on national television is no small thing. A little bit of compassion, a bit of reflection, these would have been good responses. The intersection needs work, and that work shouldn’t be expensive. But I think the footpath was designed on the basis that pedestrians would rather walk through the park rather than along the edge of it. The non-direct road crossing just follows on from that basis. I assume that pedestrians in a hurry and requiring a more direct route would walk on the other side of the road. Can’t help noticing that people (even fans of this blog) are thinking roundabouts or lights are the solutions for pedestrians, when the real issue is redesigning the roads to force drivers to (i) slow the f*** down and (ii) stop assuming they have a god-given right to not pay attention to anyone else who might be using the, you know, PUBLIC space. Those solutions speak to a world where the car really has won. The issue with this junction is the far too generous accommodation of speeding motorists. Where exactly is it that drivers making this turn are going in such a hurry that we have to enable them to take it at high speed? Drive through New Lynn on Great North Road now. They’ve certainly slowed the traffic there with all the raised islands.Much better for pedestrians (they have a shared space around the corner too). David O your assumption is correct. This intersection is terrifying for me almost every weekend in the summer, when taking our 3yr old to the park with the 1yr old in the pram, its extremely hard to control both a pram and a young one on his feet and then try to cross about 20m (seems like) of road with cars going nuts (and the drivers are usually accelerating hard where the ramps are). Its hard to see this intersection as anything other than a giant F-you to peds.